The Ann W. Richards Congress Avenue Bridge (or just the Congress Avenue Bridge) crosses over Lady Bird Lake in Austin, Texas. The bridge is a concrete arch bridge with three southbound and three northbound vehicle lanes and sidewalks on both sides. The bridge is home to the world’s largest urban bat colony, which is composed of Mexican free-tailed bats. Up to 1.5 million bats reside beneath the road deck in gaps between the concrete component structures, migrating to Austin from winters in Mexico (yes, when some people remark that there are more bats than people in Austin, they’re not necessarily talking about the city’s vibrant nightlife). 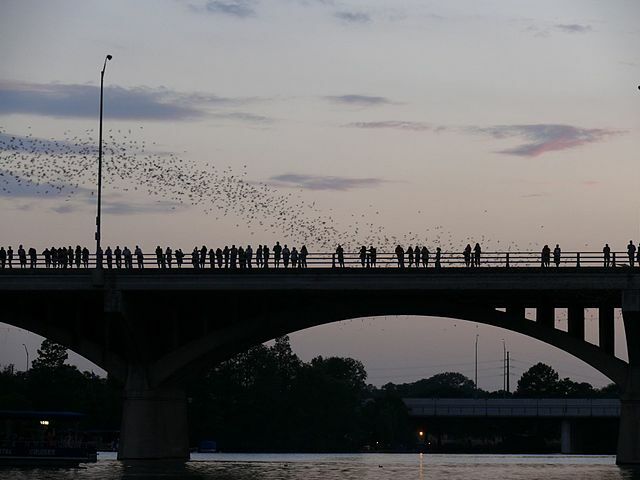 The nightly emergence at dusk of the bats from beneath the bridge, and their flight across Town Lake primarily to the east to feed themselves, attracts as many as 100,000 tourists annually. Tourists can see the bats from the bridge, from riverside and from boats.